The Keio line, the Takao line and the Sagamihara line (all Keio Electric Railway Co., Ltd.) for the class 8000 trains express alternative and the class 9000 trains Rapid alternative. 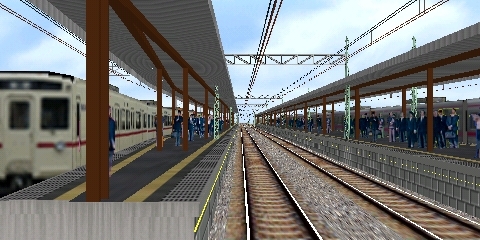 The route comes in 3 versions: Semi-Special Express from Shinjuku to Takaosanguchi; Special Express from Shinjuku to Keio-hachioji; Rapid from Shinjuku to Hashimoto. The gauge is 1372 mm and the lines are electrified (1500 V DC). Many graphic objects at the railroad. Schematic map over the Keio lines (Acrobat document) there all route alternatives start at Shinjuku near the top of the map at the Keio line. The Semi-Special Express alternative (orange line at the map) goes to Kitano, from there the Takao line and ends at the station Takaosanguchi at the bottom of the map. The Special Express alternative (red line at the map) goes all the Keio line and ends at Keio-hachioji, the other station far down at the map. The Rapid alternative (blue line) goes to Chofu and then the Sagamihara line to the right and downwards at the map to Hashimoto. Minatono's web site. Download 3 files, one from each of the 3 first Download links (those with the numbers 8000 or 9000 in front). The server to download from sometimes does not reply. Persistence may be required, but the download may finally succeed.